This is he, the Grandfather Tree. My combi tool is leaning against the trunk. The handle is about three and a half feet in length, so you can see the diameter is quite a bit more than that. 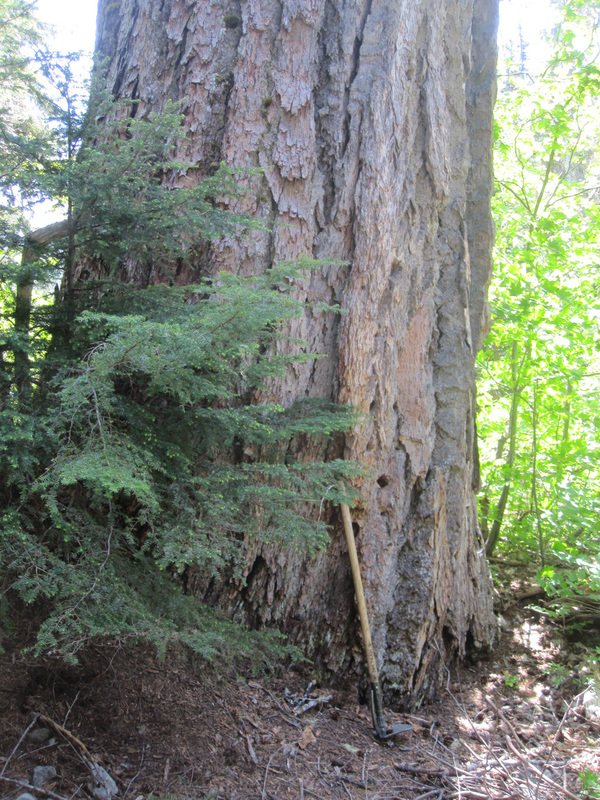 This very old Douglas-fir lives along the Pete Lake trail, near the confluence of the unnamed creek that drains Waptus Pass and the Cooper River. Grandmother is nearby, not quite as big. Uncle fell over years ago, inspiring the crew to make a new trail around where he lay across the trail. It would have taken days to saw through with a crosscut. So the trail winds through the trees right there before crossing the creek and making the final approach to the lake. We had work within sight of Grandfather today, troubleshooting a narrow spot of tread above the river. The water was noisy. The air was hot. Thrushes and warblers wove their songs through the branches, mosquitoes and flies buzzed around looking for mammalian flesh. When our problem was solved, we moved on to others. Then we hiked back the way we came, crossed the creek and stopped to filter drinking water. I looked up to see Pam with her arms stretched out along Grandfather’s trunk. She was dwarfed by the tree. I realized where I was, and stopped a moment to savor the presence of a big old living being. It blocked the sun, and I was grateful for the shade. Did I feel small, humble, young next to this tree? A little bit, but it seemed to me that my perspective was less thorough than that of an old tree. What do I know? Maybe not so much. I always wonder: if trees could speak, what stories would they tell? What advice would they give? I do love trees too. We have a very large maple tree in our yard that gives us shade and is just beautiful. It probably doesn’t have as quite as think a trunk as that one, yet it’s a really stolid, round base.